The Ontario Steelheaders can trace it’s roots as far back as 1979. 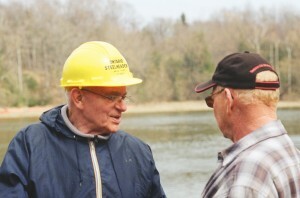 Chance meetings by the banks of the Saugeen River among concerned anglers eventually lead to more formal gatherings and the eventual formation of a club, then named Ontario Salmon and Steelhead Fishermen, an organization of people determined to represent to concerns of the angling public. In the past, the Ontario Steelheaders was made-up of many, provincial, chapters, where each club operated independently, but was considered to be part of the larger organization. Today, the Ontario Steelheaders encourages these and many other organizations to form working partnerships and work together towards common objectives. Our leaders, project chairs and volunteers alike are committed to working as a team in the pursuit of our goals and objectives. We hold regular meetings for discussion, strategizing, instruction and conduct of the affairs of the organization. Our Vision is an Ontario where steelhead trout angling opportunities abound, are self sustaining, and are supported and protected by government. To improve access to suitable spawning habitat for migratory steelhead rainbow trout. To provide young steelhead rainbow trout with suitable nursery and juvenile habitat. To enhance and protect steelhead rainbow trout angling opportunities in Ontario. To provide relevant and appropriate input to government, agencies and other organizations consistent with our mandate. To educate members and the public on relevant issues, conservation practices and proper angling techniques. To protect and increase public access to our waterways for steelhead trout fishing and recreational purposes through examplary co-operative partnerships and input to government, Ontario landowners and other relevant organizations. 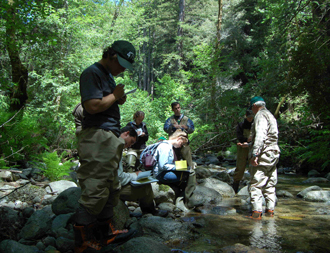 Ontario Steelheaders performing stream assessment. 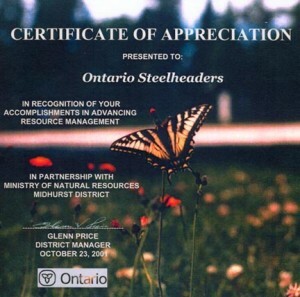 The Ontario Steelheaders is committed to working both independently and in partnership with local Ontario organizations, governments, resource networks, and various like-minded agencies in the pursuit of responsibly enhancing and protecting Steelhead fisheries in Ontario, Canada. Since no two watersheds are the same, the strategies for managing these watersheds and fisheries should be uniquely fitted to adequately address the challenges at hand, and the desired results. The Ontario Steelheaders recognizes the efforts of various clubs and organizations across the Province of Ontario and commends their efforts. Many of these organizations share a common goal with the Ontario Steelheaders of a better, brighter future for fisheries in Ontario. We have seen many changes in our fisheries over the past forty plus years and there will be many more in the future. The Ontario Steelheaders, in partnership with local organizations, government bodies, and agencies can positively affect the fishery resource. We have also earned a very credible reputation with Government bodies and agencies as a result of our stream improvement commitment and also from our rational contribution to policy and planning issues. Want to get involved? Find out more about the easy ways you and your family can get involved.